The green color is the color of hope, the color that makes us feel good. The green color makes us feel closer to nature, just for that reason and without realizing it; it reassures us and fills us with happiness. The green color is ideal for any room in your home, but if there is a room par excellence that green can be ideal, this place is undoubtedly the bathroom. We are used to the bathroom being blue, white or other neutral colors and tranquilizers, but green is undoubtedly a great option to consider. In addition, the green color is a color that creates trend and that never goes out of fashion; nowadays it is color is trend. Green means nature and freshness, it encourages us to live a healthier life and to be aware of the sustainable options that life presents to us. Green does not have to be just a simple update of the bathroom accessories; it must be a conscious lifestyle. The green color can even change the way you feel towards your closest environment. Green can mark a new beginning; it is like a redefinition of the way we live today. To enjoy the benefits of green it is not necessary to have a large garden. Add some plants in your bathroom or throughout your home is a good idea to have this wonderful color and also can combine with the rest of colors that you want from your favorite palette. 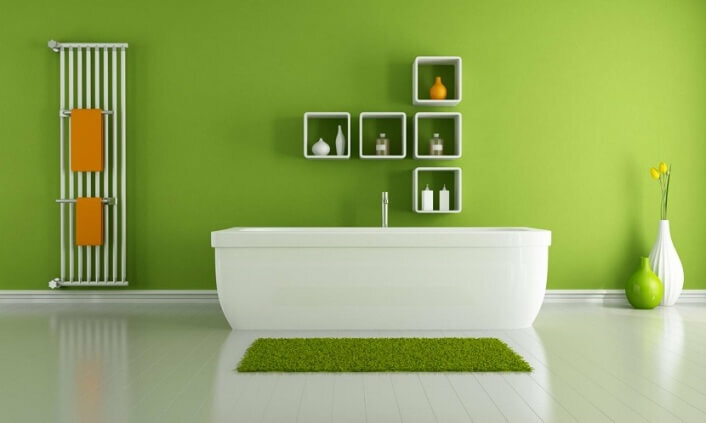 The use of the green color in the bathroom will help you feel the nature inside your home and you will feel that it is a space of rejuvenation and relaxation that will boost your general health and your physical and emotional well-being. You can combine green with white to create a good harmony; for example, you can have white walls and accessories in green or vice versa. In your bathroom you can also create a mini-forest to enhance the green color if you have other colors and prefer to maintain them. You can go to your nearest nursery and ask about the plants that can survive in a humid environment such as the bathroom. Depending on whether or not you have natural light in your bathroom, you should also ask about species of plants that survive well with little or lots of natural light. It is important that you make sure that the green color fits well with the decoration of your bathroom. You can also introduce accessories of natural colors such as wood, which will fit great with the green bathroom because it will make you feel that you are in the middle of the forest with the green of nature and natural wood. The green color that added to your home and in this case to your bathroom, are much more than a simple color, trend or decorative style. 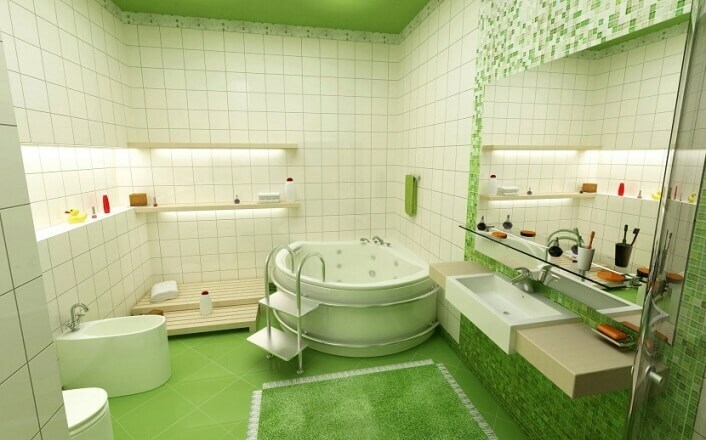 The green color will help you to feel better, to relax every time you are in the bathroom and you can even change your lifestyle thanks also to the plants. Little by little you will be more aware that the care of nature is essential because you will feel more connected to it. Or you can simply decorate with this color because you like it and it is to your taste, without more. Being the excellent results in any case and getting this color that transmit well-being just look at it.